Let see How ? Firefox load pages up to 40% faster! 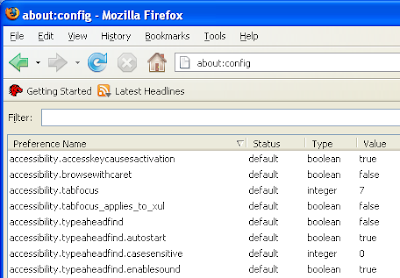 Type about:config on the Firefox address bar and hit Enter. This will display an alphabetical listing of preferences by name, as well as a search bar at the top. 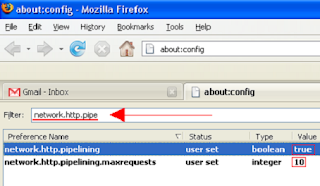 Type network.http.pipe on the Filter search bar. A narrowed down list will appear showing preferences network.http.pipelining and network.http.pipelining.maxrequests and their current values. 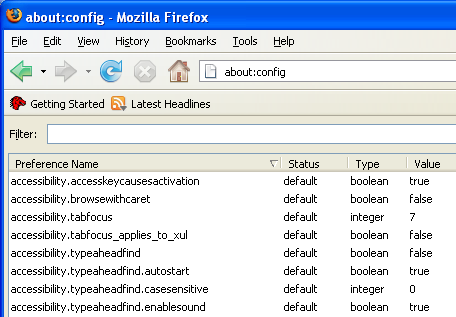 To enable the turbo feature in Firefox you will need to manually create a preference. Right-click anywhere on the page and select New and then Boolean. Enter browser.turbo.enabled as the preference name in the New boolean value box and click ok, and then set the value in the Enter Boolean value box to true. That’s it, now simply close and restart Firefox, and you should see an immediate 10% to 40% increase in web page transfer speed, and faster opening of your tabbed windows ! The Boolean preference network.http.pipelining enables an experimental acceleration technique called pipelining, which speeds up the loading of most Web pages. A browser normally waits for some acknowledgment of a given request from a server before attempting to send another one to that server; pipelining sends multiple requests at once without waiting for responses one at a time. The integer preference network.http.pipelining.maxrequests controls the maximum number of requests that can be pipelined at once. There’s not much evidence that going above 34 will help.